One of the best parts of traveling is exploring the cuisine of wherever you are, but what happens when you have a child that is picky and won’t try anything out of their comfort zone? There are several levels of picky. There is the kind of kid who doesn’t really like to try new foods, but reluctantly will and finds they like it. There is the kind of kid who likes a large number of foods, but won’t go outside those specific meals. And then there is my son, who doesn’t really eat much of anything. Pasta without sauce. Grilled cheese. Mac and cheese. Peanut butter without jelly. Bagels. Pizza with only bbq sauce, not tomato sauce. Pretty much any carb you can think of, and fruit. When we travel we really struggle with making sure he is getting the right foods to keep him nourished and to keep him healthy. While we can find Italian restaurants almost anywhere we go finding some of the other staples of his diet can be trickier, especially when we travel overseas. So, what can you do? I know we aren’t alone in this struggle, and no one wants to think they are starving their children for the sake of travel. - Vitamins. These are something we give our kids every day regardless, but while we travel it is even more important, to help keep them healthy and give them some of those vitamins they are missing out on with food. - Peanut butter. I am very aware of all the allergies in the world, and wouldn’t bring this on the plane, but we bring the individual size packets of peanut butter with us so, as a last resort, we can make a peanut butter sandwich. No matter where we have traveled in the world we have been given bread for breakfast, so we either us that or head to a local store to buy some. - Cereal bars. These are easy to pack, easy to throw in a day bag, and easy for kids to eat. - Dried fruit. There may be some restrictions on whether or not you can bring this into specific countries but they are a mess-free way to have fruit on the plane, and if you can bring it where you are going, an easy way to have it throughout the day. - Snacks for the plane (that may or may not be allowed into your destination), including string cheese, bags of apple slices, crackers. A snack pack of apples on a plane is not only healthy, and yummy, but it is fun to play with too. She played with these for 45 minutes, and on a 10 hour flight every minute counts! - Straws. We use straws with tubes of yogurt, and in case there is no kid cups with a lid you can pop in a straw and make it easier for kids to drink from grown up size cups. We have found that straws aren’t as readily available around the world as they are here. When we order food for him we always try to make sure there is one thing ordered that we know he will eat, and hope for the best with the rest of it. Fortunately our daughter is an amazing eater, although at the age of 2 we know anything could change! Food? Yes mommy, bring it on! As a last resort we have been known to find an American chain restaurant (although not McDonald’s, since we have the only children in the world who won’t eat it), or pizza. And despite the fact F insists on pizza with bbq sauce only he can be persuaded to eat it without sauce at all. Some other helpful tips are to stay in an apartment or hotel suite with a kitchen, find the local grocery store and spend some time finding food they will eat, and let go of the idea of 3 balanced meals a day – rice for lunch and ice cream for dinner every now and then won’t hurt them! Grocery shopping in Spain – this was not at all appealing to our son but we loved it! A little creativity and pre-planning can certainly help when a child isn’t as into food as the rest of their family. And a lot of hope that it will change in the future! Do you have a picky eater? What happens when you travel? This entry was posted in Uncategorized and tagged picky eater, snacks on plane on April 30, 2013 by andrea922. Well, you may as well go to a playground next to the planes, right? We live really close to a local airport, one that caters to small private planes, charters, corporate jets, which means that we are under their flight path (which is both good for planespotting and bad for noise!) and that we are incredibly close to the playground they have which is located right under the control tower and right next to the runway. We have been visiting this playground since our son was a baby, and now both kids love going there. There are two restaurants there as well, so you can watch the planes take off and land while you play or while you eat! It is a win win situation for all travel loving kids. This entry was posted in Uncategorized on April 26, 2013 by andrea922. Throwback Thursday; Do Kids Remember Travel? I get asked often not only why we travel but why we travel when our kids don’t remember any of it. I know that our son, F, remembers trips he has taken over the past couple of years, and he is only 5, so I don’t think a fear of children not remembering is a good reason not to take a trip, but it just makes it more important to document your trips with both photos and words. One of our favorite things to do is look at vacation photos and talk about where it was and what we saw. I have written before about why we like to travel, and how I started traveling at a young age thanks to parents who always valued the importance of traveling with kids. So, it seems only appropriate with everyone doing Throwback Thursday with photos that I revisit the very trips that were so special to me, and to remind me of why we want to raise our kids to be world explorers themselves. My parents started traveling with us when we were young, and we took our first international trip, to Canada, when I was 2. While I don’t remember that trip I do remember the ones after, to Mexico, Japan, Hong Kong, China, Costa Rica, Spain, France, Ecuador, Chile, Russia, Ukraine, Austria, Germany and more. The one thing my dad always did during a trip, in a pre-email, pre-laptop, pre-blogging world, was to dictate what we were doing on our trips, and then type them up when we returned. I have stacks of ‘stories’ about these vacations; what we did, what we saw, how we felt. I love rereading them, filling in the holes in my memories of trips taken when I was a child. He encouraged, and still does, my love of photography, and we have albums of photos to sort through and scan. I am so grateful that when it wasn’t so easy to document our adventures he took the time to do so. So, over the next few weeks, once I have sorted through pictures (and scanned them in) I will share some of these, embarrassing pictures and all, and hope you all do the same! And, as a teaser, I spent part of a Summer in Spain when I was 10, with a family, where I liked to dress up like a flamenco dancer apparently! Do you have memories of your first trips? How old were you when you did your first big trip? How do you document your travels for your kids? This entry was posted in Uncategorized and tagged throwback thursday, travel memories on April 25, 2013 by andrea922. We are a family of four, and between us we have 6 passports, soon to be 7. I will, once my husband gets his US citizenship, be the only member of our foursome with one lone passport. With two kids under the age of 16 that means we have to renew both of their 2 passports every 5 years, which can be a hassle to say the least. 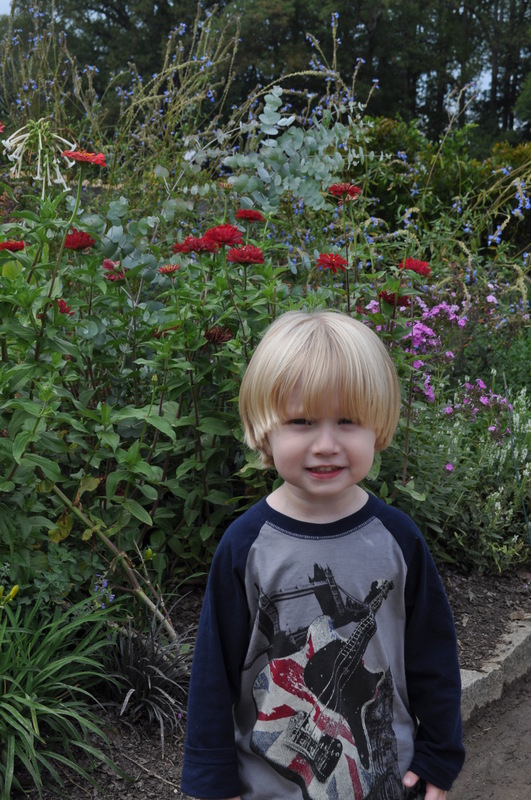 F, my son, was born outside the US, in London, and had both his US and UK passports by the time he was 7 weeks old. L, my daughter, was born inside the US, and had both of her passports by a similar age. The process for getting these passports was not dissimilar, except the UK ones can all be done by post, and the US ones have to be done in person, with both parents present (or a notarized letter from the absent parent), and this continues every time you renew it until they are 16. So, with my son turning 5 this year, and a trip to the UK and Spain last month, we had to renew his passports. The UK one, as always, was easy, filled out some forms, sent in some photos, and had it back within a week. The US one? Well, like everything else with our government, wasn’t so simple. I took my kids to the post office to renew his passport, after waiting almost a month for the appointment. I had everything laid out last night; the application, his UK birth certificate, a copy* of his Consular Notification Of Birth Abroad, Pictures, and a notarized letter from Lee saying he gave permission even though he couldn’t be there. We get there. We wait. The kids play, they get yelled at by a big postal worker who didn’t want them sitting on what appeared to be a bench but was apparently not a bench and subsequently sent my daughter straight to my arms and my son clinging to my legs, so I was feeling slightly beaten down at this point. And then we got called up. It was fine at first, she checked all our papers, said everything was okay, until she got to his UK birth certificate. And then, well, this happened. Her: So, this is what? A foreign birth certificate? Me: Yes, yes it is. He was born in England. And there is his passport, and my passport, and you can see that it is all it asked for. Her (looking it over suspiciously): But, this is a foreign birth certificate? From the UK? Is it translated? At this point I take a moment to collect my thoughts. I remind myself, several times in a fast mantra, that she has the power and we NEED this passport. Me: Well. No. No it isn’t translated because, you know, it is from England. Where they speak English. Her: Hm. Okay. Well, they won’t take it. I need the official Consular Notification of Birth Abroad to prove his citizenship. Me: Um, isn’t his current US passport proof of citizenship? I mean, they gave him that one. And it doesn’t say on the application that you need anything other than that. Her: I know, but you need to look at the list like it is a new passport, where it does say that. Do you have his green card? Me: Nope. No green card. Because, well, he is a citizen. As you can see from his passport. This went on, and on. She agreed to hold our envelope ‘open’ for us, so I could come home and get the official Consular Notification of Birth Abroad. And then I went to pay and they don’t take credit cards. Fortunately for a mere $1.15 more I was able to do a money order because, really, who carries checks around with them now? Not me. We made it home, and under much duress went back, she took our form, I thanked her profusely, walked out and wondered how the US government can find the stupidest employees in the entire world to work in every post office I visit. - Always check, double check and triple check what you need. And bring more than you think, because apparently a child passport renewal should be treated exactly like a new passport, even though they have already received a passport once before. The logic baffles me as well. - If one parent can’t be there make sure you download the appropriate form to be notarized from the web site. They won’t take a general letter, it has to be a specific form. - Most post offices that do passport applications also take the photos. But you can also get them at Costco and most major drugstores. - Take a deep breath, prepare for the worst, bite your tongue because they have the power, and think of the adventures to come! Have you had any crazy passport experiences? This entry was posted in Uncategorized and tagged child passport, dual citizen, infant passport, renewing child passport on April 23, 2013 by andrea922. One of our goals in showing our kids the world is also teaching them a healthy respect for not only the citizens of the world but for the Earth itself. With a 5 year old who would rather be digging in the dirt more than anything, looking for animals and nature, this isn’t a difficult task. Oceans, mountains, deserts, they all are fascinating to him and he would enjoy a trip that encompasses any and all of those things as much as, if not more than, a trip to somewhere like Disney. Our two year old enjoys whatever her big brother does! So on this Earth Day we talked a lot this morning about one of our favorite trips, to Yellowstone. This National Park is amazing, full of wildlife and gorgeous scenery and all the Earth a young boy could ever want. We visited in early September, and made our base camp Teton Village, which I think most people would think of as Jackson Hole. 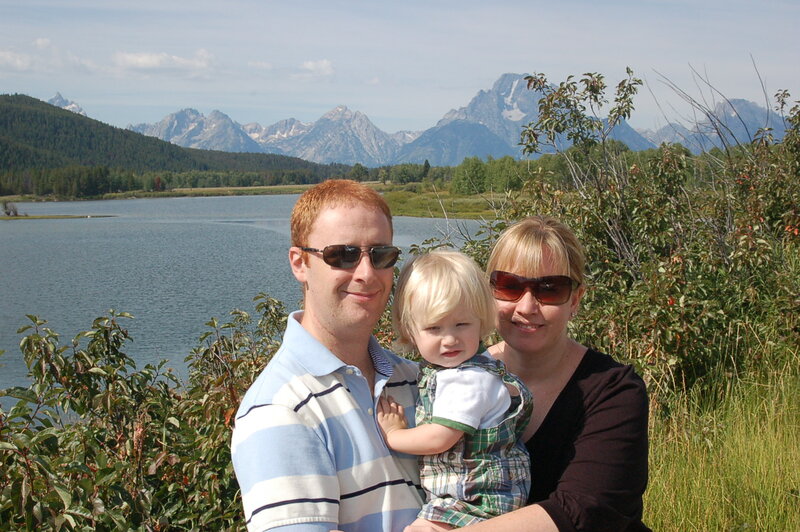 We rented a house and spent our days driving to Yellowstone (with one full day driving through the park to Montana and a night there, and then the next day driving back), and also spending time at the Grand Tetons and Jenny Lake. It was an absolutely magical place to take children, and I hope we can take both kids back some day. When I revisit these photos I can’t help but think what a wonderful world we live in, isn’t it? How do you teach your kids about Earth Day? Where you have you been that is “Earthy”? This entry was posted in Uncategorized and tagged Earth Day, Grand Tetons, Yellowstone on April 22, 2013 by andrea922. We are not really beach or hot weather people. As in, with 2 blondes and 2 redheads we are a sunscreen companies best customer. My kids sweat, a lot. They turn red and cranky and want to find air conditioning asap. They are not fans of super heat, but if we stayed home during the hottest months of the year we would miss out on so many amazing opportunities and travel experiences. So, we make the best of it! 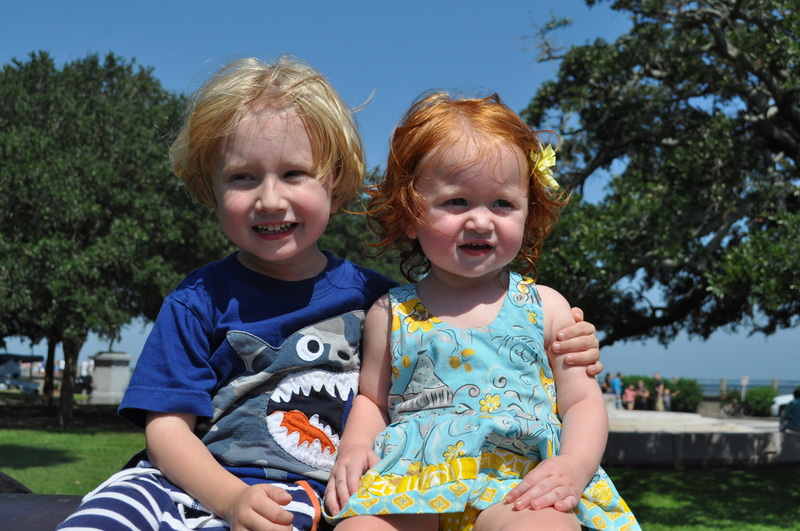 Last September we headed to Charleston, a humid, hot city on the water. A gorgeous city, but hot. Did I mention hot? We packed up some hats, the bathing suits, lots of sunscreen, and took sweaty pictures of our kids. We found fountains to splash in and ice cream to eat. With lots of water, a double stroller and snacks they enjoyed themselves in spite of the soaring temperatures. This entry was posted in Uncategorized and tagged charleston, photo friday, traveling in hot places on April 19, 2013 by andrea922. A lifetime ago I spent some time working at a well known international magazine in London, and did a piece on airport layovers with kids, in airports that have areas that make layovers, or as I like to call them, playovers, fun. I didn’t have kids at the time, although I was pregnant with my son, so the info I found wasn’t as important to me as it is now. With flying being one of the most stressful parts of traveling, and adding in a layover making it worse, we have hunted down some of the best airports to be ‘stuck’ in with kids! Winnipeg International Airport: Located at the North end of the second level of the airport this bear themed playground has a corkscrew climber, a spiro slide, a 30 foot tall polar bear and an arched bridge. Logan Airport: Their unique Kidport play areas are located in Terminals A and C and have vintage airplanes, a replica of the control towers, climbing structure, slides, tvs and seats for parents. Singapore Changi Airport: This airport is loaded with kid-friendly activities, from a butterfly garden to a children’s playground to an entertainment deck with tvs and video games, a family zone, koi pond, movie theater, swimming pool and more. Hong Kong International Airport: With 2 play areas throughout the airport catering to young children kids can play or they can visit the children’s tv area for those little ones already tuckered out. Auckland International Airport: The airspace entertainment centre is located in the international terminal and features a Lego activity center, a Crayola coloring corner and a model flight simulator. If your ‘playover’ is long enough, or your flight is seriously delayed, harried travelers can check out the outdoor playground and two mini golf courses located right outside the airport. San Francisco International Airport: SFO’s Kids Spots are interactive exploration areas created with jet setting kids in mind. There is also an aviation museum pre-security and an aquarium in Terminal 1. Chicago O’Hare International Airport: There are two areas within this airport just for kids, including “Kids on the Fly”, which has model airplanes and helicopters and a control tower. In the B Concourse of Terminal 1 there’s a 4 story high, 72 foot long Brachiosaurus dinosaur from the Chicago Field Museum. 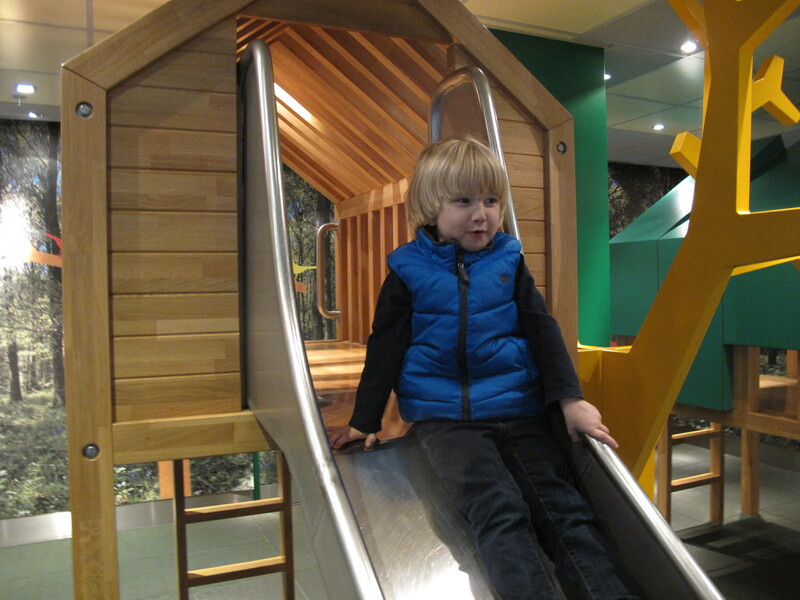 Seattle Sea-Tac International Airport: There is a 1,400 square foot kid’s playground area between the center terminal and concourse A.
Amsterdam Schiphol International Airport: The kids forest is located on Holland Boulevard and includes slides, tree houses and other climbing and play equipment. There is also a Panorama Terrace which allows you not only a great view of the airplanes taking off and landing but has an airplane you can walk around in. She was eating some food another child gave her, which is definitely not something I would normally condone! There are certainly a fair amount of airports that do not cater to children (Atlanta’s Jackson Hartsfield and London Heathrow Terminal 5 I am very much looking at you!) so we have to find our own entertainment, which has always involved finding a quiet gate in the terminal, sitting by the windows to watch the planes, playing hide and seek, reading books or watching the iPad, any of which my kids thoroughly encourage and recommend. Playing hide and seek while delayed at JFK on our way to Madrid. Without many places to hide it takes some imagination but they were up for it. Sometimes the iPad is the only option. For our son he wishes it was always the only option. Sticker books are a great alternative to playgrounds when there are none! I am sure we have missed lots of great family friendly airports! Which ones have you been to that you would recommend for a playover? Which ones wouldn’t you recommend? *All of these were correct at time of publication but may have since changed. Check ahead of time to ensure they are all still there! 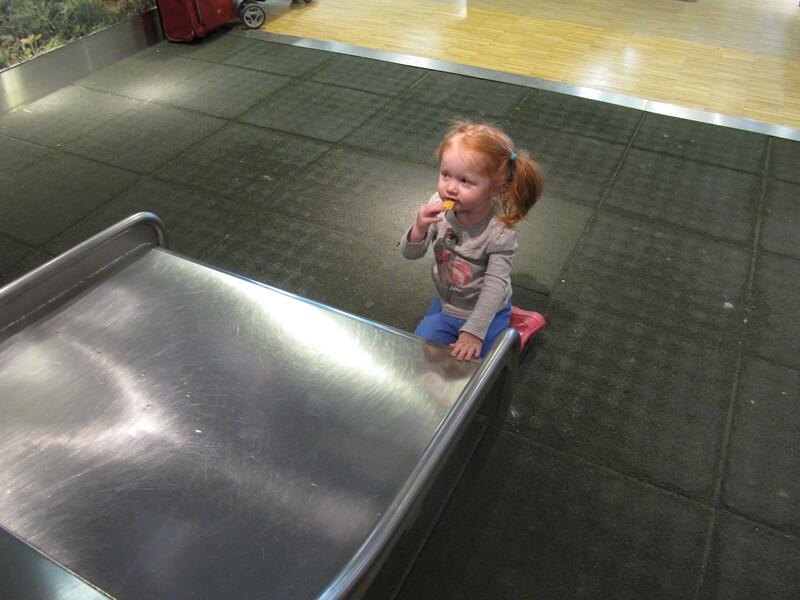 This entry was posted in Uncategorized and tagged airport playgrounds, layovers, playovers on April 18, 2013 by andrea922. This photo was taken in the middle of a tour of The Biltmore Estate in Asheville, NC. While I would recommend the Biltmore in general doing the tour of the house with a 3.5 year old was likely not our wisest decision, as he dashed in front of the (generally) older people taking their time and the ropes used to keep people out were like a flashing sign saying ‘Come under me, Come under me!’. He then dropped his pants on the front steps outside to pee, and that is when we knew we were done with the house. The rest of the property, however, was perfect for kids. 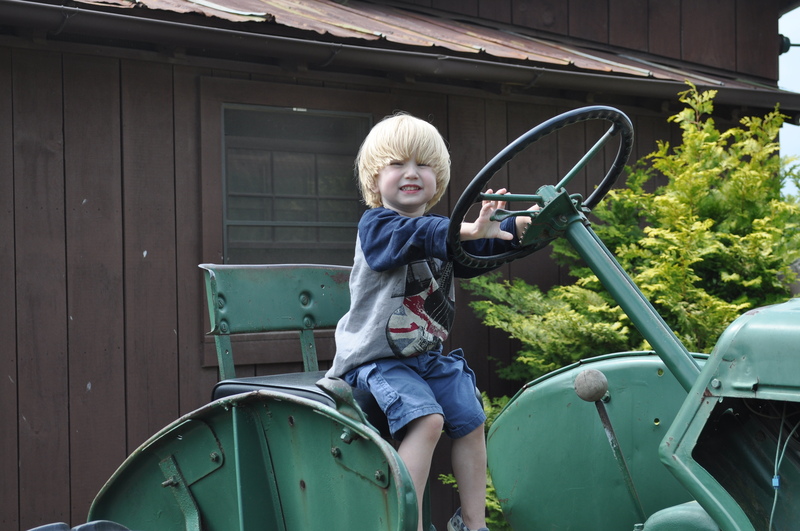 Gardens to run through and a farm to visit and general outdoor goodness, as well as an Irish pub that was great for families. Tickets are free for kids 9 and under with a paying adult, and since the tickets run in the range of $44 to $70 per person depending on the time of year and how early you purchase them it is a nice bonus to get the kids in for free. Enough of the house, time to explore the gardens! This post is part of the Photo Friday link up at Delicious Baby! 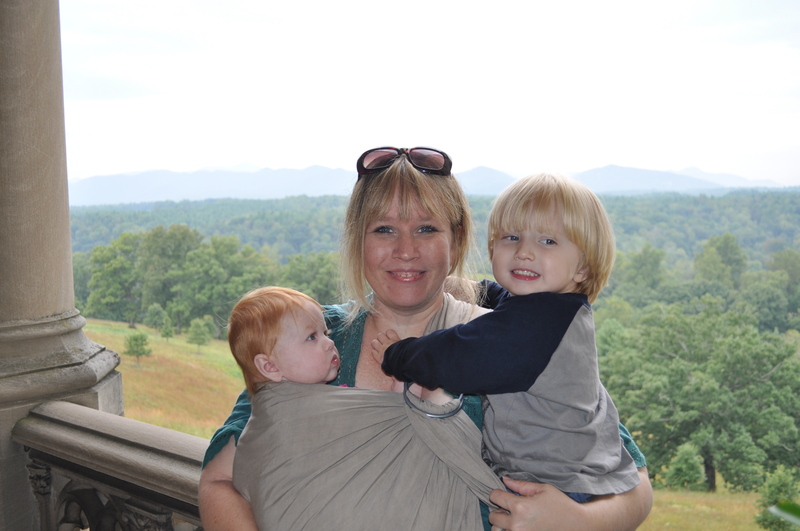 This entry was posted in Uncategorized and tagged Asheville, Biltmore with kids, Staying in the picture on April 12, 2013 by andrea922. Families In First Class, A Right Or A Wrong? If you ever want to stir up a debate when it comes to travel all you have to do is mention that you think it is okay for kids to fly in first/business class, sit back and wait for the fireworks. I have seen comment sections on blogs explode over this, and while you always have a commenter or two who throws in the pot that kids shouldn’t fly at all it is always pretty much an even mix of yes and no. The first time we flew business class overseas with our son he wasn’t even 4 months old. We boarded the plane, prepared for the glares of people around us, and took our seats. A kind flight attendant told us that if anyone gave us grief to remind them that we had just as much right to be there and that everyone on that plane was a baby once themselves. 8 hours later we landed and we had people telling us they didn’t even realize we had a baby on the plane. He did the return trip 10 or so days later, and then did another overseas business class flight at 8 months. While our good luck streak ended there we have a firm policy of taking business/first class if possible and we don’t think twice about it. When you are making this decision, which, let’s be honest, is a pricey one, whether it be money or miles, there are a few things to keep in mind that definitely make it worth the cost. Before you get on the plane you have access to the airline lounges where you can have a place to relax, eat (drink!) and prepare for the flight. You have more space, more personalized service, shorter lines for the bathrooms, better food, and you will be on and off the plane first, not to mention amenity bags – kids go crazy for the socks, eye masks and other random things they include! 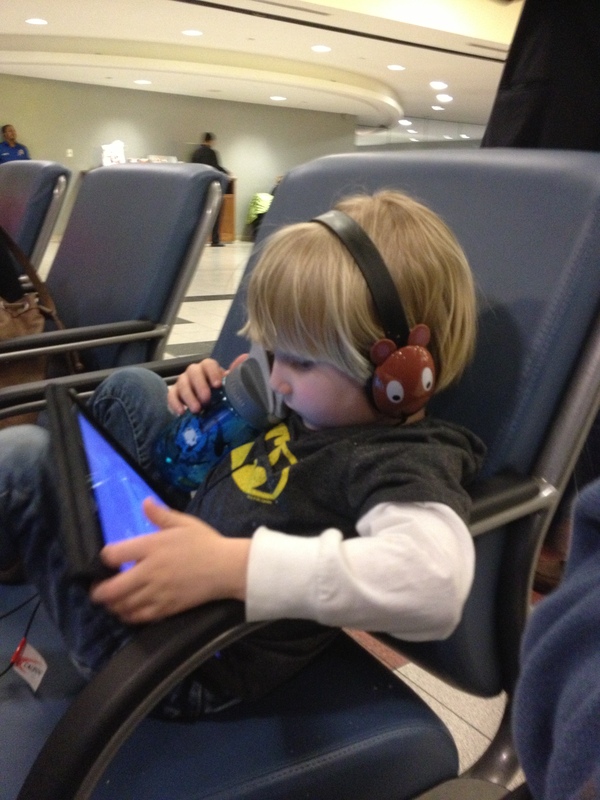 Kids enjoy having more space, and better entertainment options (at least on US carriers). Is it worth it? It was for us, and hopefully will be again someday. Until every airline has sky nannies like Gulf Air we can only be so lucky to have the extra conveniences that flying first/business provide. Since most people don’t have an extra $5000 or more per person for a first/business class ticket there are a couple of ways to get up there for less. You can buy an upgradeable ticket, which is more than an economy/coach class ticket but less than FC/BC, and then use points to upgrade. You could use points for the whole ticket, but those seats generally go quickly, especially on more popular routes. Many airlines off the opportunity to upgrade the day of for a per person, per leg amount, although sometimes the upgrade is only to premium economy, which provides more leg room than economy/coach. And traveling off season would increase your chances for upgrades as well. Would you fly with your kids in first/business if the opportunity arose? Have you? This entry was posted in Uncategorized and tagged first class with kids. upgrade on April 11, 2013 by andrea922.